We are honored to nominate Greg Sorensen as a 2016 Star of Life for his dedication to EMS, as well as for his instruction of the art and science of prehospital medicine to numerous EMTs and Paramedics entering the field. His 32-year commitment to caring for his community is deeply commendable. 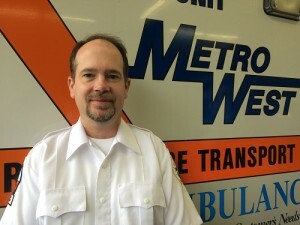 With a 10 year start in EMS, Greg began his career at Metro West Ambulance in June of 1999 and became a Field Training Officer in 2004. Greg also fills in as an Operations Supervisor, co-chairs the QI Committee, and is a member of the communication center’s QI Committee. Greg is an outstanding example of personal integrity, dedication, and compassion in EMS – qualities everyone strives for in their own EMS careers – and truly represents the gold standard of prehospital emergency care. Greg works with various EMTs, Paramedics, and potential new hires on developing their skills in the field and teaches them the past, present, and future of EMS. Greg knows the future of EMS is built on teaching these individuals to be the best medical providers possible. In his spare time, Greg helps facilitate volunteer projects for the needy in the community he lives in, and he helps facilitate yearly volunteer projects for Doernbecher Children’s Hospital. These are but a few reasons why Greg Sorensen deserves the honor of being an American Ambulance Association 2016 Star of Life.